Browse through our delightful collection of pink sapphire engagement rings. Combining pink sapphires with brilliant-cut diamonds, each design is handcrafted to perfection and beautifully presented with free shipping on all orders in addition to the reassurance of 60-day returns and a lifetime warranty. A beautifully simple four claw diamond solitaire engagement ring with rich pink channel set Sapphire shoulders. Certified central diamond. Choice of central diamond colour and clarity. Supplied with 14 x pink sapphires set into the shoulders, adding an additional 0.21cts of sapphire weight to the ring to compliment this. Pink Sapphires are 1.5mm diameter and are a natural Sapphire. Explore our delightful collection of pink sapphire rings. Each design stands out in colour and contrast—set with vibrant pink sapphires paired with natural white diamonds. Each sapphire and diamond ring receives expert care and attention. Crafted from a range of precious metals, small white diamonds surround natural pink sapphires—bursting with colour. Pink sapphire engagement rings are perfect for any proposal. 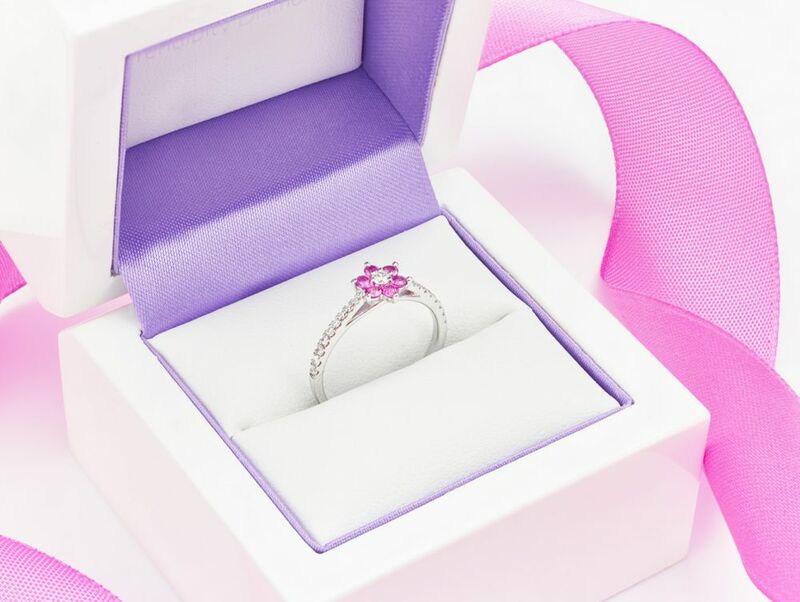 Our signature design is the Tickled Pink engagement ring. A central brilliant-cut pink sapphire rests between smaller sizes of diamond. 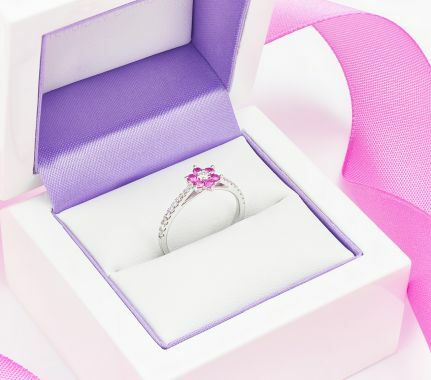 Many buyers choose a pink sapphire and diamond engagement ring as an affordable alternative to a pink diamond engagement ring. Natural pink diamonds demand very high prices owing to the rarity of natural fancy coloured diamonds. Pink sapphires provide the ideal baby, pastel or bright pink colour ideally searched for—at a fraction of the cost. Please remember that we can mix and match pink sapphires with any of our all-diamond designs to arrive at your perfect combination. We are always happy to quote for any diamond and pink sapphire ring style. Please contact us at any time for more help and guidance.